Austin is famous for many fun (and funky) things - bluebonnets, breakfast tacos and continuous live music, just to name a few - but the bat has become almost like a mascot to the city. Upon my first night in Austin, I found myself walking through a crowd peering over the railings of the Congress Avenue Bridge anxiously waiting to see these nocturnal residents fly out from underneath them. I grabbed my spot on the bridge and, soon enough, a massive dark cloud of some 1.5 million bats were pouring out from under us heading south. While watching, I was amazed at just how many were down there. So, if you find yourself on Congress Avenue at sunset like I did, hurry over to “the bat bridge” and witness Austin’s longest running natural show you have to see to believe. The Congress Avenue Bridge was renovated in 1980, and while a smaller number of bats already occupied its underside, the addition of new expansion joints made for an ideal bat cove attracting migrations by the thousands. Originally, the people of Austin found bats as a threat and wanted to get rid of the new found colony, but eventually the people came to understand the Mexican free-tailed bats to be gentle creatures. Since then, the Congress Avenue Bridge bat colony has become the largest in North America. Each night at dusk, both locals and visitors alike gather to celebrate the city&apos;s unofficial mascots that flock to Austin between the months of April and October. Some of the best places to watch them are from the sidewalk on the bridge or right underneath the bridge at the Statesman Bat Observation Center. Take your experience from the ground to water with Lone Star Cruises or Capital Cruises which will put you right in the midst of the action on Lady Bird Lake and provide an unbeatable view. Take the bat watching tradition and mix in a little Austin weird, and you get Bat Fest! 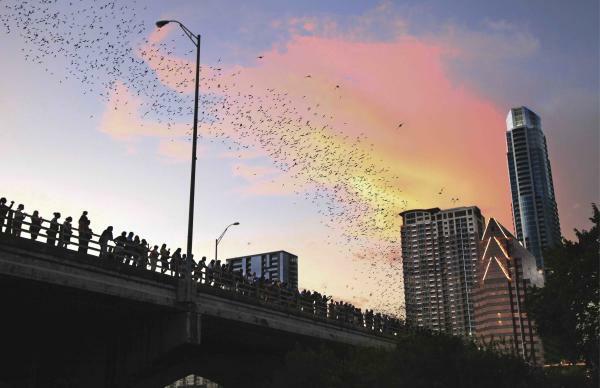 Because Austin loves its bats so much, an annual festival is held right on Congress Avenue Bridge in late August (peak migrating season) and has become the biggest bat-viewing party each year. True to any celebration in Austin, Bat Fest provides live music, food and drink, craft tents and a bat costume contest in order to really celebrate the animals that make this city so unique. This year’s Bat Fest takes place on August 20th, 2016. The festivities begin at 4 p.m. and run until midnight. Tickets are available online for $23 and at the gate for $25. However you do it, watching the bats fly is crucial to having the full Austin experience. If you do get a chance to see them, make sure to snap a picture and share it with us using the #TrueAustin on Instagram or Twitter!